As you might imagine, it’s taken me a bit longer than I thought! 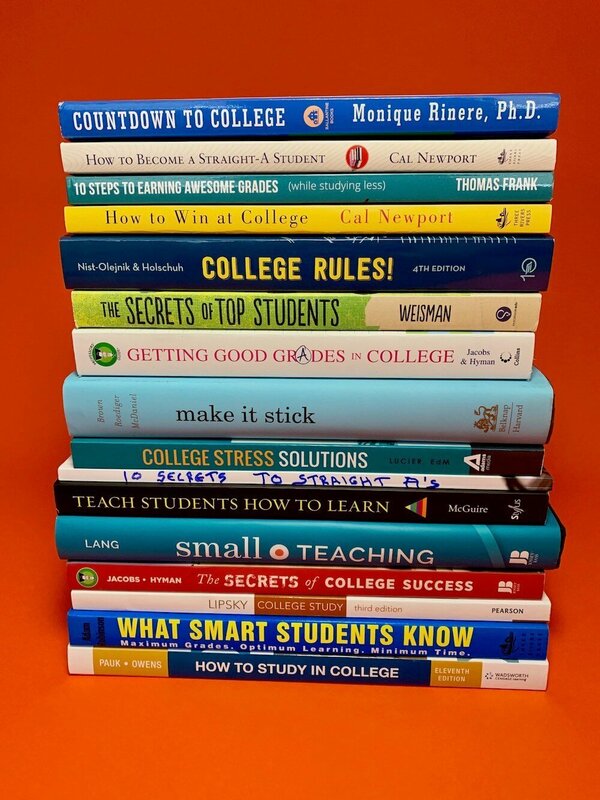 I’ll start writing blog posts about what I learned from all of these books, but let’s talk about how to prepare for exams first. Most of these books start with other topics and then lead up to the exams. That would seem to be the logical order, but I decided to reverse that. I’m starting with exams. What caused me to do that was a golf school that I recently attended. The instructor’s premise was that the most important objective in golf is what happens at the end – impact. If the goal is impact, then why not just set up for it in the first place? That is, configure your stance, arms, grip, as they will be at the moment you arrive at impact. From there, simply rotate back and through and you will hit the ball perfectly every time. It works. If you want to play better golf, learn it. Ok, so maybe not the perfect analogy, but in college, being prepared for exams is the end goal. Remember, this isn’t about taking exams, it’s about preparation for exams. Everything you do should be done in a way that makes it as easy as possible to review and retain information in the most effective way possible. So what exactly is the best way to do that? All of the books I’ve read generally recommend some form of method that I’m about to discuss. Make it stick. By Peter Brown, Henry Roediger III, and Mark McDaniel. This is a book that I highly recommend to every college student who cares about doing well. GET THIS BOOK! It is only 253 pages and the core of how to do it covers about 150 of those pages. Before I explain how to prepare for exams the right way, I want to cover what is the wrong way of doing it. 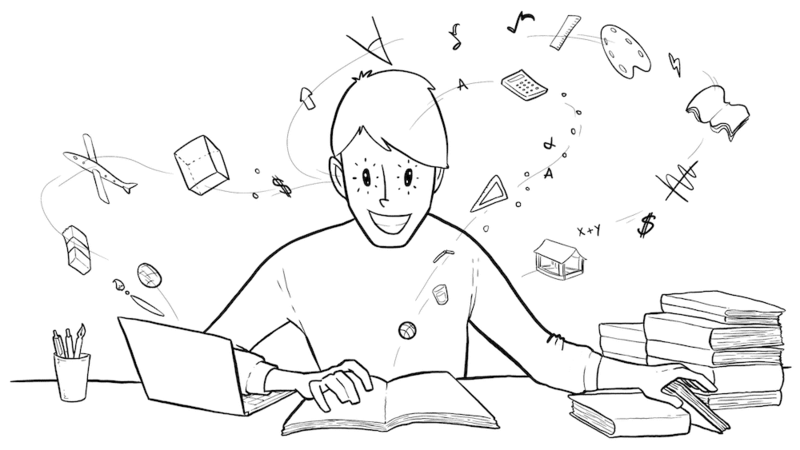 There are several ways that students typically study for an exam. One of the worst ways is cramming, or what the author refers to as ‘massed practice’. That is, waiting until the last possible moment and then re-reading and reviewing material in one or more very intense long blocks of time right before the exam is given. Cramming can work to some extent to get you through the exam, but the stress is high and the risks are great. Another method that is less stressful is what the vast majority of students do. They open their class notes or textbooks and start paging through. They are skimming and re-reading, looking at the headlines, highlighted areas, illustrations, and other parts of the page. If they think they know it, they keep moving on. What they are also doing is looking for things that they think they DON’T know. Then they’ll stop, read and re-read those more intensely until they feel comfortable that they know them. The problem with this re-read method of study is twofold. First of all, students that study this way waste a lot of time focusing on what they already know, instead of focusing on what they don’t know, but they don’t know what that is. Secondly and worst of all is that simply reading and re-reading is not an effective way to actually commit knowledge to long-term memory or effectively apply that knowledge to complex scenarios that typically appear on exams. They are only giving themselves a false sense of security that may prove illusory when they take the exam. Just looking at something, again and again, isn’t enough. That’s just putting it in. To make it effective, you have to pull it out. In Make It Stick, the authors refer to this as ‘retrieval’. That is, doing self-quizzing so that you are consciously forcing yourself to recall the information and not simply re-reading it. Everything you learn in lectures and in textbooks is ultimately going to be turned into a question of some kind. If you know you are going to be asked questions, then start asking them yourself. This goes back to the golf analogy that I used above. If you know that self-testing is the best way to prepare for an exam, then set up notes and textbooks to do self-testing as effectively as possible. First, make sure you take all class notes using the Cornell Note Taking Method. This is simply dividing each notebook page into areas by drawing a line down the side of the page about one-third of the way over. Take your notes on the wider side and then leave the narrow side open to write test questions. Studying your textbooks the right way is also extremely important. I recommend highlighting textbooks, not as a way to come back and do a mindless review, but rather as a way to identify testable concepts. Once you’ve done that, you can formulate questions and create your own self-testing routine. If your textbook has wide enough margins, write your test questions there. If not, then use a notebook or loose leaf paper. You can self-test in a variety of ways. Simply doing it mentally is good, but actually speaking it will be even better. Practice answering out loud. Recite it. Make complete answers that add supporting material and explanation. Say it as if you are teaching it to someone else. Writing it out is another way. Varying retrieval methods will help long term retention. Use flashcards, do problem sets. Whatever the class and the material to be tested dictates. Don’t just review, DO, and do it frequently. As you can imagine, you can’t self-test just once. It is most effective when it is done in multiple sessions over time. Do this self-testing on a regular basis continually from the time you learn the material all the way up to the exam. It’s easier to take small bites and do them more frequently. How often you should do it depends on the difficulty of the material and how well you are retaining it. There is no starting too early. Literally, the next day after you learn about the material for the first time may be both acceptable and beneficial. Every day is too much. You should have a day off and forget some of the material. It is beneficial! Some difficulty and effort ‘retrieving’ actually improves retention long term. Do a little review every few days or more if the exam is a way off. Get a feel for how much you are retaining. As you get closer, go to every other day. Remember, you don’t have to try to do weeks of material at once. Focus on one chapter or one set of notes. Quiz yourself on those concepts and see how you do. The benefits of self-testing are many and indisputable. First of all, you find out early what you know and don’t know. You can meet with the professor and get help way before the exam. Secondly, you are taking small bites at a time. It is much easier to focus on one set of class notes or one chapter than trying to do it all at once. Lastly, you aren’t wasting time on things you already know. You can check off the things you are sure you know and give more attention to those that you don’t. 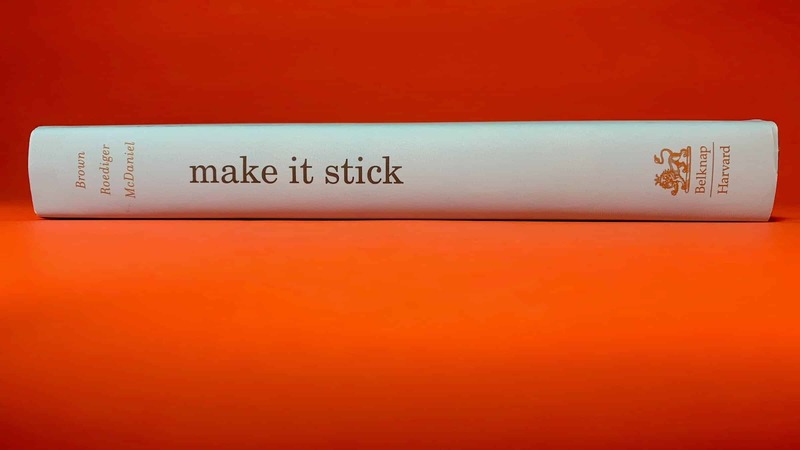 In Make It Stick the author speaks of how most people think that they will do better if they do things with a ‘single-minded focus’. That is, if they just practice one thing with great intensity and duration, they’ll master it faster. Studies show just the opposite! Success is actually greater when you use what is referred to as ‘interleaving,’ which is simply mixing up your practice so you don’t do too much of one thing for a long period of time. One example is a tennis player who hits 100 forehands first and then 100 backhands, or a golfer hitting 100 shots to the exact same distance. One might think that doing 100 of one thing first and 100 of something different next would be better. Not so. Mixing each of them up continuously throughout the practice actually makes the player better at both. More importantly, it gives the player a better ability to actually apply the skills in a real game when they will have to react instantly and instinctively. This has also been proven especially useful in math where instead of doing one type of problem multiple times, students do different types of problems in random order. Mixing them up was more effective at solving them. Mixing it up will keep from getting bored as well. Pounding the same thing over and over just gets monotonous and you’ll quit before you even get the practice done. I never liked the term ‘study’ for an exam. I view studying as the acquisition of knowledge. That is, when you first learn it and understand it. To actually recall it and apply it, you don’t study, you practice. That is you ‘DO’ it, whether that means quizzing yourself, working problem sets, or thinking through different ways to apply it. You’ve probably heard the saying ‘practice makes perfect.’ Actually, it doesn’t. Dave Pelz, the famous golf instructor likes to say “perfect practice makes permanent.” I agree. Preparing for your exams the correct way will get you better grades with less stress. It will help you make your knowledge more permanent and give you the ability to apply it more intuitively and creatively. Many of the classes you take now are prerequisites for even harder classes to come. Everything you do now will carry over to the next semester and make those classes easier still. Start building a solid foundation by practicing, not studying for exams. One last thing. If you do need to cram for an exam, don’t just scan and re-read the material. Try to quiz yourself. Formulate questions out of the material and ask them out loud. Then give the answers out loud as well. Reciting and trying to remember by heart will be far more effective at committing the concepts to memory than just silently reading them. Next time, avoid cramming for an exam and do self-testing early and often. Confirm that you know the material and have it committed to memory. When you do, the actual exam will be the easy part. Write test questions for anything you may be tested on. Start reviewing them as soon as you can. Take small bites. Just focus on one set of class notes, a chapter, or even a single concept at a time. Do self-testing every few days whenever you have spare time. Even if you only have time to ask yourself one or two questions. As you get closer to the exam, focus your time and effort on the things you don’t know. By following these simple steps, you will get better grades with less stress. I’ve tried the active recall method – and it works better than rereading notes, because all that would do is make you feel like you know it. Enjoyed these tips – especially about spacing out the studying.. way more effective than cramming that’s for sure! Why Do A Study Plan? Copyright 2019 How to Study Smart, LLC - All rights reserved | Terms | Privacy | HTML Sitemap | Website by Wild Side Design Co.